Tony Whyton (Birmingham City University) and George McKay (University of East Anglia) have a planned co-edited special issue of the leading publication, International Journal of Heritage Studies, on research findings and perspectives from the CHIME project. In the past few weeks two of the articles have been pre-published online, in advance of paper publication in the special issue. We will keep you informed when further pieces are available, and of course when the special issue is complete and available. But in the meantime here are information and links about the two to date. ABSTRACT: The JPI-Heritage Plus supported Cultural Heritage and Improvised Music in European Festivals (CHIME) project was established to examine the workings of jazz festivals and their relationship to cultural heritage as discursive practice. Jazz festivals occupy a significant – if undervalued – place in the ecologies of Europe’s cultural heritage, with their dynamic and synergetic relationship to spaces and cultural sites. Drawing on a number of case studies and interviews with members of the Europe Jazz Network, this article presents a typology of European jazz festivals and cultural heritage sites that can be used to inform the different ways in which jazz offers meaning to specific groups and locations. By viewing jazz festivals through the lens of cultural heritage, we can begin to challenge reified presentations of heritage that promote uncomplicated interpretations of nations, people and their associated cultural narratives. Festivals offer meaning to specific groups through acts of remembrance or commemoration, they have the potential to engage with a multitude of voices, and their locations enable people to negotiate a sense of belonging or to (re)consider their place in the world. Request open access version here. ABSTRACT: This article explores site-specific heritage questions of the contemporary cultural practice of festivals of jazz – a key transatlantic music form – by bringing together three areas for discussion and development: questions of slavery heritage and legacy; the location, built environment and (touristic) offer of the historic city; and the contemporary British jazz festival, its programme and the senses or silences of (historical) situatedness in the festival package. Other artistic forms, cultural practices and festivals are involved in self-reflexive efforts to confront their own pasts; such are discussed as varying processes of the decolonisation of knowledge and culture. This provides the critical and cultural context for consideration of the jazz festival in the Georgian urban centre. Preliminary analysis of relevant jazz festivals’ programmes, commissions and concerts leads to interrogating the relationship – of silence, of place – between jazz in Britain, historic or heritage locations and venues, and the degree or lack of understanding of the transatlantic slave trade. The heritage centres clearly associated with the slave trade that also have significant (jazz) festivals referred to include Bristol, Cheltenham, Edinburgh, Glasgow, Hull, Lancaster, Liverpool, London, and Manchester. Open access version here or here. [George McKay writes] I am delighted to announce the publication of Francesco Martinelli’s long-awaited EU Creative Europe-funded book, The History of European Jazz. It’s an impressively massive collection, in terms of scope and content, and has 40 chapters, one of which, on European jazz festivals, I wrote. My chapter is an output of the CHIME European jazz festivals project. The new book was launched at the 2018 European Jazz Conference in Lisbon a couple weeks ago, where, by the way, several CHIME team members were involved in the Jazz Researchers network meeting. Here is an extract from the opening of my chapter. … There is something quite remarkable across Europe about the contribution of promoters, producers, musicians and jazz enthusiasts to the development of jazz festival culture, which may have been overlooked in the scholarship, and which we can identify via a brief consideration of the pivotal US jazz festival, at Newport, Rhode Island. The inaugural Newport Jazz Festival, held in July 1954, was actually advertised as the ‘first annual American jazz festival’—and in that sense of ‘first … American’ festival rests an acknowledgement that the term jazz festival, and the very idea of an event such as a festival of jazz music, had already been invented elsewhere. Among any other claims of jazz innovation Europe may feel it can make, this one may be worth sticking with. This is not an argument made for the purpose of cultural chauvinism—rather it is one presented to encourage us to think further about the complexities of innovation, transmission and circulation of live jazz music in the transatlantic frame. That the early jazz festival was innovated and developed in Europe is striking—from the late 1940s on, that is, the very early postwar years in a devastated continent, the organisation and advertising of the new cultural event of the festival of jazz music began to take place. At the jazz band festival ball there was felt to be a good new buzz, and there was a collective spirit, and the idea spread quickly through the 1950s, and would go on to influence also the innovative rock and pop festivals and mass musical gatherings of the 1960s and 1970s counterculture. 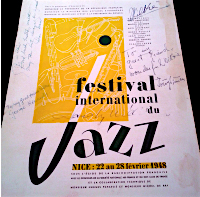 In the space of only half-a-dozen years the jazz festival spread, from, notably, Nice (1948) to Paris (1948 and 1949) and on to the Belgian coast at Ostend and Knokke (also 1948), to London (1949) to Newport by 1954. Following that, the journey behind the Iron Curtain took only a couple of further years (Sopot, Poland in 1956). Of these earliest festivals, we can reasonably say that Nice and Newport are the most notable, because of their extraordinary longevity. Nice and Newport have been with us most years, on and off, here and there, for many decades…. A new report produced by the Urban Institute with partners at the African Centre for Cities explores how festivals are integrative sites between tangible and intangible heritage in the context of the Sustainable Development Goals. Professor Beth Perry has been working with a network of academics and practitioners in South Africa, Kenya, Sweden, the Netherlands and the UK to explore how culture, and cultural heritage in particular, can play a role in supporting more just urban transformations. The network has addressed this question through the lens of festivals, drawing on international cases from CHIME. The 18 festivals in the report focus on the relationship between global frameworks for action and local cultural practices and learning. The report highlights concerns over implicit cultural and instrumental biases which inform policy statements at multiple levels. Whose culture, whose heritage matters? How do international frameworks reflect cultural diversities across the Global South and North? What tensions and issues emerge in the instrumentalisation and essentialisation of culture as a tool in sustainable development? What does this mean for action at a local level, within and beyond state actors, to support cultural diversity and support cultural democracy and justice? In raising these questions, the report sets out an agenda for research, policy and practice to ensure that coordinated action supports the search of more just, inclusive and sustainable cities. This exhibition tells a story of jazz festivals in the Netherlands through objects. It is a story that originates in the jazz competitions held in the 1930s and which encompasses about 85 years of music, people, festival sites, and objects. While over the years jazz festivals have grown to cover a wide range of musical styles, performers, audiences, and venues, some consistency can be found in these festivals’ ambitions to engage with international musicians and to connect with local communities. Museum, that explores world history from two million years ago to the present. A collaborative project between CHIME, the Nederlands Jazz Archief (NJA, Dutch Jazz Archives), and photographer Foppe Schut, the exhibition is designed as a digital travelling exhibition, to be projected at festivals and conferences. We have focused specifi cally on awards, merchandise, jury reports, and other artefacts that have been produced as part of the festival, or which – in the case of the scrapbooks – have been made with festival artefacts. Most of these objects are in the repository of the NJA. Consequently, this selection excludes other parts of material culture that are indisputably part of festivals, such as festival sites, instruments, music stands, gear, clothing, portable toilets, food, or beer stands.